I’M STARTING 2014 with a wish list and some empathy. Not my own wish list — my patients’. That’s where the empathy comes in. I’m imagining what changes they would wish upon me, by putting myself in their shoes. Actually, my shoes are top of the wish list. I keep mine at work because I ride a bike, and I’ve noticed patients are starting to stare at the unpolished bits. This year I’m determined to fix that, even if it means buying some shoe polish. Number 2 is home visits. I think my patients would like me to do some. It’s hard on a pushbike because I have to change shirt and shoes, which brings me right back to the polish problem. Not the Polish problem: Walesa solved that back in ’89. Number 3: Decrease waiting times. Now, you and I both know that this is an unsolvable paradox, but even patients can dream, can’t they? The paradox is that the longer a patient waits, the more they feel they deserve a long appointment. Get them straight in and they sense your urgency, but leave them to wait an hour and they’ll have come up with a medical wish list longer than your stethoscope. First on their problem list? Decrease waiting times. Number 4: Less talk, more action. I do tend to soliloquise. Ask about proteinuria and I’ll give you a leaky-kidney analogy involving chicken soup and coffee filter paper. The narrative varies according to time of day: before lunch is more chicken soup, but late arvo is all about the coffee. This week’s adage: all bodily explanations can benefit from a coffee-related analogy. Number 5: Ditch the med student. For some reason, many of my patients consider that the doctor-patient relationship is a two-person affair. A mate of mine did his entire physics PhD on the intricacies of three-body interactions, and he assures me that human beings are even more complex than protons. Unfortunately, given my teaching commitments, I can’t think of a solution to the med student problem, unless perhaps I hide some of the smaller ones in the drug cupboard. 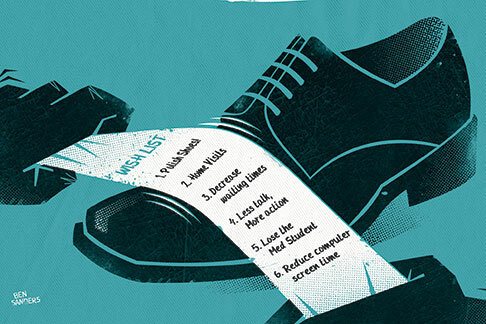 Number 6: Reduce computer screen time. I have already started working on this, making eye contact occasionally regardless of whether the presenting complaint is ophthalmological. My patients are beginning to feel listened to when I look up from the screen, although purists would say I should stop typing as well. The touch typing plays havoc with my notes: the patient is describing bowel habits and I’m trying to punctuate from memory. We both have colon problems. So the wish list remains largely unfulfilled. But this year I’m determined to buy shoe polish. This entry was posted in medical writing and tagged Flippant, humour, Medical Observer, wish list. Bookmark the permalink. And for 2015 you can commit to actually using some shoe polish. Step at a time Justin! 6. a. Get the med student to do the typing! John F Buckley, you are the guru! One would think you had been training GPs for umpteen years. Your list trumps mine in virtually every respect. I’ll work on it all–particularly the med students typing–although I doubt I shall ever master the art of silence. That only comes at a transcendental plane about three steps higher than my own. Justin, if your transcendental plane is 3 steps lower than is needed to master the art of silence, mine must be at least 10 below that. On the positive side, I have lots of room for improvement. I love a good list, and between you and John, I reckon you have both the wisdom and the humour beautifully covered. Well done to you both. I think walking a mile in a patient’s shoes is a wonderfully empathic gesture. And just think… if you choose the right patient – one with a comfortable and well-polished pair in which to walk – and get some speed up, you might solve both your home visit and dearth of polish problems in one quick footwear swap! Personally, I think talk is important. In gossiping about shoes (and yes, chicken soup) I learn far more than any mini-mental could teach me – staff and patients included. doctor, writer, coffee addict and shoe fiend…we have much in common. Except possibly that your shoe collection is more Imelda Marcos, while mine is all Cliff Young. Judging by your blog, you deserve at least a few decent pairs, though, to check out all the wonderful sights of Europe. No one should climb Mont St Michel in worn runners or walk the Via Dei Servi in thongs. But we are all brought down to the same level having our shoeless toes nibbled by Singaporean Doctor fish: I had mine munched on last year. Which gives me pause for another reflection…do they also nibble to toes of non-doctors? I finally bought some new israeli brand shoes after the shoe polish kept rubbing off my old shoes which I’d been wearing for 10 plus years. Great to discover your blog site – I have been a great fan of yours since about 12 years ago when I returned to GP land in indigenous health after nine years maternity leave and one of your humerous columns described the non-linear nature of general practice and the confusing stories that our patients come out with. Was comforting to know it was not just me missing a ” diagnosis” having been out of the work force for so long. Thanks Wakinyjan – great to hear from another doctor in Indigenous Health. And it sounds like I’ve been rabbiting on about the same topics for at least the last dozen years! If nothing else, at least I can give comfort to the confused. Some of my fellow GPettes band members wear T-shirts onstage printed with ‘The Unconscious Incompetents’. At least you and I are conscious of our confusion!